In an ideal world, we’d all be rich enough to have a separate bathroom for every day of the week and enough cash to change our bathrooms when we got a bit bored of the tiles. Unfortunately the real world doesn’t work like that, and even though the economy appears to be recovering, there are still lots of us feeling the pinch. If money worries are stopping you from giving your bathroom a much needed makeover then don’t despair as there are many simple ways to make over your bathroom on a budget – from finding bargains to easy, free ways to make your bathroom feel fresh. Part of the reason why a new bathroom or hotel en-suite looks so impressive is because the surfaces are clear of bottles, jars and items like soap and toothbrushes. Achieving this look in your own home is just a matter of time rather than cost, so spend half an hour de-cluttering your counter tops by hiding away as much as possible in cupboards or drawers. It’s fine to leave a couple of attractive perfume bottles on the window ledge or leave your staple bottle of shampoo in the shower, but if there is no room in the shower tray to stand up as it’s so full of bottles, it’s definitely time for a clear out. If you can’t bare to keep your bathroom essentials out of reach, there are lots of cheap, or even free, ways to arrange your favourite products. 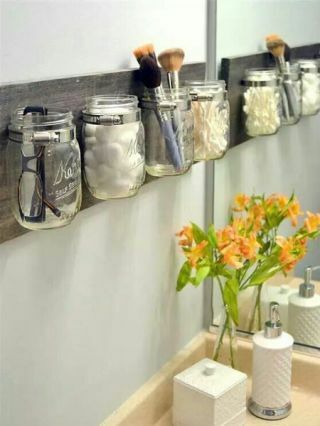 Try reusing jars to make a novel alternative to a cluttered shelf – ideal for holding toothbrushes, make up accessories and cotton wool. 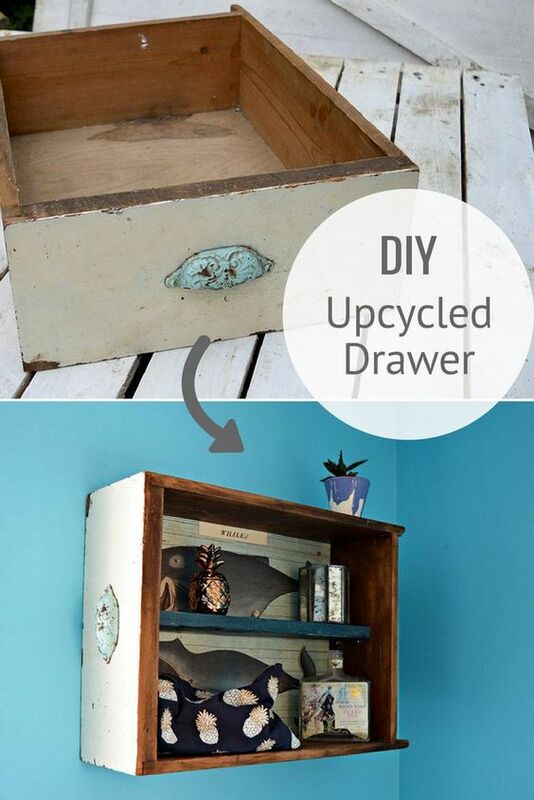 Use old furniture (or parts of furniture!) to create unusual and shabby chic shelving alternatives. If you’re lucky enough to have a larger bathroom, there’s no reason why you can’t add an armchair, side table or even a chest of drawers from elsewhere in the house. As well as providing excellent storage for all those items you’ve just decluttered, an extra table or wooden chest gives you somewhere to put a plant, vase or other decorative object which is just gathering dust elsewhere in the house. Adding seating will also be a great excuse to spend more time pampering yourself and enjoying your newly invigorated bathroom. Furniture can be given a new lease of life by painting it using whatever paint you have lying around in the garage, just remember that heavily varnished objects will need to be rubbed down first. Think creatively, and if you don’t have any suitable furniture keep an eye on local sites like Gumtree or Freegle where you may be able to pick up other people’s cast off pieces for nothing. Bathrooms can often appear bland and boring because there is no artwork on the walls. Adding some interest to your walls doesn’t have to be expensive, and if you are creative you can draw or paint something yourself. That could be a budding masterpiece or something simple yet effective. Plain canvases are easily found in high street shops; they can be painted simply (either using a single colour or a basic pattern) and arranged really effectively, for example, putting three shades of the same colour on three adjacent canvases or frames. Alternatively, head down to the local DIY shop and pick up some colourful wallpaper samples which you can frame and use in the bathroom, make a collage from old holiday postcards, or arty greetings cards. Scour the local car boot sales or jumble sales for some pictures or frames which grab your attention. Even swapping around artwork from elsewhere in the house can give your bathroom a whole new look. There are also more unusual decorative ideas you could use. Box frames are cheap to buy and give the option of a 3D scene. 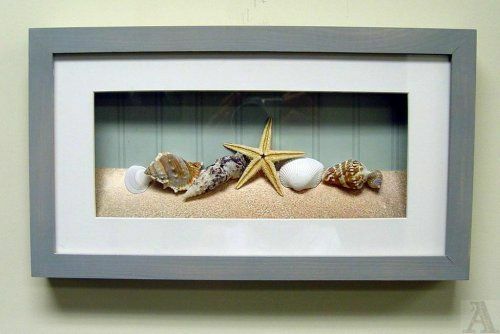 Why not use small ornaments or shells and sand to fill the frame and give your bathroom a ‘Seaside Sanctuary’ feel. Buying paint and completely overhauling your bathroom can be costly, but most of us have half-finished pots of emulsion kicking about in the shed or garage, and this could be just enough to give your bathroom a new look. If you’re happy with the colour of your room, adding a fresh layer in key spots can really freshen it up, covering up any scuffs and marks. If you haven’t enough paint of one colour to do the whole room it’s time for thinking outside the box a little – what about painting each wall a different colour? Or mixing two shades together to create a new colour? Or painting stripes? Remember that if you’re painting over a dark shade you will need enough paint to do a couple of coats, and if you are mixing paint stick to all the same type in the mix; don’t try to mix gloss, emulsion and silk paint all together in the same pot. One man’s trash is another man’s treasure and this concept has been well and truly embraced online. There is a whole community of people who would prefer to give away perfectly good, used bathroom suites and furniture rather than see it go into landfill. Sign up for websites like Freegle, Freecycle and Preloved and keep an eye open for freebies in your area, many towns and cities have Facebook groups advertising free and bargain items that are no longer wanted. You’ll have to be quick as it’s often the first person to respond who gets the goodies, and you’ll have to be prepared to pick items up and install them yourself. You can however get some perfectly good items and all it will cost you is petrol to collect. Remember to “pay it forward” by offering your unwanted items too rather than chucking them in the bin. What Paint Should I Use in the Bathroom?